Wu Ma’s cheap 70s chopsockies are meatier than your average, a director not merely content to get the best physical performances out of his cast but also allotting valuable screen time to put flesh on his characters. Yu Tien-lung plays flamboyant villain Master Hung, a Ching Dynasty consul with political and personal links to the Emperor. With his psychadelic robes and greying mane he looks a bit like a member of Slade, masterminding his villainy via the brownnosing exploits of his loyal minions, played by Dean Shek and Wu Ma favourite Dorian Tan. Their mission: to find a stolen list of Sun and Moon revolutionary fighters stashed inside a highly sought after kung fu book. Meng Fei has the book. He’s a cocksure youth with great crane style kung fu who must decide whether to show loyalty to his corrupt government in exchange for wealth and power, or side with the plucky band of rebels. There’s a honking twist in the story which looms into focus with all the stealth of a double decker bus, but on the whole the revenge backstory is handled well despite its predictability. 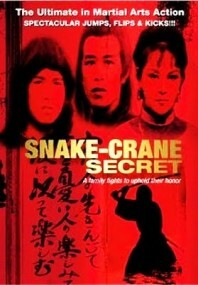 And watching Meng Fei’s crane style combine with Dorian Tan’s Snake Fist is a treat worth sticking around for. Studio: Kim Hin Film Enterprises Co.